Facial Paralysis can be devastating to live with, especially as a child. Children can have varying forms of facial paralysis that can be a result of a variety of different factors. Some children have a developmental disorder like Moebius Syndrome, a congenital abnormality, or trauma at birth which can all cause facial paralysis. Bell’s palsy and Lyme disease are other causes of facial paralysis in young children. Parents often wonder how old their child should be before considering surgical treatment for facial paralysis. 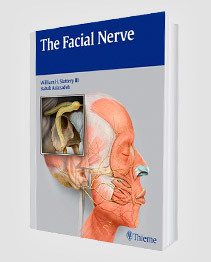 Facial Nerve expert Dr. Azizzadeh operates on children as young as two years old, depending on the type of paralysis and what surgery would be most beneficial. Since his training at Harvard, Dr. Azizzadeh has become world-renowned for his expertise treating adult and children with various forms of facial paralysis. He has extensive training and experience with microsurgical facial reconstruction which is often required to treat patients who were born with facial paralysis. He has authored five best-selling textbooks and is the founder and director of the Facial Paralysis Foundation, which offers support and information for people affected by facial paralysis. 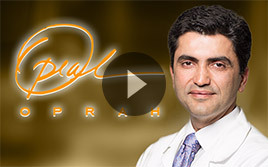 Dr. Azizzadeh is widely regarded for his facial nerve work and has been featured on the Oprah Winfrey Show along with countless other media outlets. Dr. Azizzadeh has been asked to host the International Facial Nerve Symposium in 2017 which is considered to be the highest honor in the facial nerve field. Any child with facial paralysis needs to see a facial nerve expert like Dr. Azizzadeh to find out what surgery they are a candidate for. Children who have unilateral facial paralysis might be eligible for a state of the art surgery called masseter to facial nerve transfer. 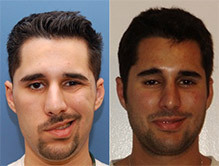 This surgery helps to improve facial reanimation and symmetry. During this surgery, Dr. Azizzadeh harvests the trigeminal nerve that activates chewing muscles and surgically attaches it to the paralyzed nerve. This allows for neural input to be delivered to the once paralyzed muscles. Dr. Azizzadeh believes that this surgery is one of the best options for creating a natural smile. It can be performed on children as young as two years old as long as they are a good candidate for the procedure. Not all children will be candidates for a masseter to facial nerve transfer. In these cases, it’s possible that a gracilis muscle transplant would be most beneficial. In this type of surgery, Dr. Azizzadeh harvests the gracilis muscle from the child’s thigh. He also includes the gracilis’ vein, artery, and nerve and attaches it to the paralyzed side of the face. During this procedure, Dr. Azizzadeh uses either the masseteric nerve or cross face nerve graft as the nerve source to move face. Cross face nerve grafts provide a spontaneous smile mechanism while the masseteric nerve is used to treat Mobius Syndrome. Sometimes Dr. Azizzadeh will use both for a “dual” innervation. This surgery can be performed when the child with facial paralysis is five years old. 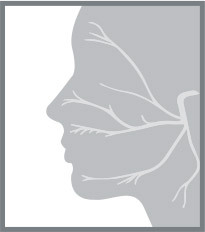 Facial paralysis can be both physically and mentally challenging. Children who have facial paralysis often face trouble eating and drinking normally, and also realize that their face looks markedly different than their peers. Deciding to schedule surgery to treat facial paralysis at a young age allows children to benefit both physically and emotionally as soon as possible. When the problem is corrected early on, children don’t’ have to worry about not being able to smile or express emotion like their classmates and friends. 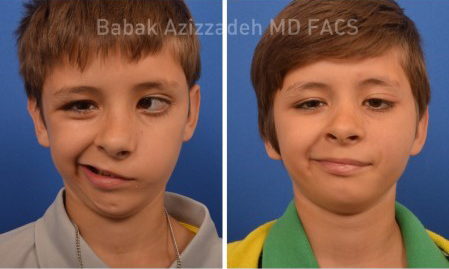 If your child was born with or has developed facial paralysis, call the Facial Paralysis Institute to schedule a consultation with world renowned physician Dr. Babak Azizzadeh today (310) 657-2203.